Contra Costa Chess Club: East Bay Open Results & CHESS this Dec. 12 and Dec. 15!! East Bay Open Results & CHESS this Dec. 12 and Dec. 15!! Hi Everyone . . . there's fun over the boards this Thursday evening Dec. 12th 6:15 p.m. - 11:00 p.m. and Sunday afternoon 2:00p.m. - 6:00 p.m. at Carl's Jr. located at 1530 Kirker Pass Rd., Clayton, Calif., come and go anytime, start the earlier the better for the best tables, more games, and really nice company! Results of the 2nd Annual East Bay Open are in. Grand Master Enrico Sevillano successfully defended his title, winning the top prize of $1000 by finishing as a clear winner in the Open Section for the second year in a row! Manny Perez tied for 2nd place with Jimmy Heiserman, Vignesh Panchanatham, and Andy Applebaum, when Jimmy edged Ricardo de Guzman in a very tight 5th round contest. Full results are posted on the Club page of USCF web site - Click here for the full breakdown.
. . . And speaking of clear winners and perhaps a chess master of the future, we're proud to announce that our very own club player Dmitri Dobrynin was the clear winner, the absolute First Place finisher, the Champion (whose Chess Coach the past few months has been FIDE Master Ronald Cusi) of the U1600 Section!! 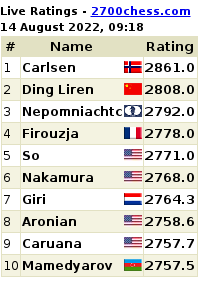 Dmitri held his ground with 4 wins and 1 draw for a total of 4.5 points out of a maximum possible of 5 points, and saw his overall USCF rating rocket up by more than 200 points! In 2nd place right behind Dmitri was Bill Kelly, Jr., who had 4 solid wins against only 1 loss for a total of 4 points! Right behind Bill was youngster Jeremy Chen with 3.5 points and a clear 3rd place finish! Young Hans Niemann, who plays in our club, shared 1st place in the U2000 section with Owen Overton of Walnut Creek. Our club player Nenad Zagorac found himself in the money circle once again, tied for an U1800 category of the section with Eitetsu Potharam, as Berkeley School's Andrew Mueckenberger took clear honors for 3rd place in the U2000 Section, with Sacramento's Conrad Cota in a tie for 4th with Ganesh Murugappan. In the U1200 Section, Michael D'Alfonsi won a tough 5th round match against Karen Minasyan to force a 4-way tie for 1st place with Karen, Meiyappan Sathappan of Fremont, Calif, and one of our newest club players, Henry Benaid! A highlight of the U1200 Section was a match between Chris Theodorou and Fred Tabisaura, with a Robby the Robot action figure as the King on Chris's side of the board. I won't say who won the match, but if sometime during the tournament you heard some strange little tinny voice cry out "Danger, danger, Will Robinson!!" . . . . . . Worst spill of the tournament honors go to club player Stewart Spada, who nearly ruined his opponent's chessboard, and really did a number on the tablecloth with all that coffee . . . and who can forget Chris accidentally putting his right elbow in his glass of water, there went another board and tablecloth, as players nearby were nearly in tears trying to hold in their laughter . . . Anyway, it was all fun, very challenging, and definitely a success, with much thanks to Chief Tournament Director Richard Koepcke, Club Tournament Director Anthony Blessing, and many others who helped promote and make the tournament something to look forward to again, others like Manny Perez, Ronald Cusi, Enrico Sevillano, Ricardo de Guzman, Nenad Zagorac, Scott Cameron, Bill Kelly, Jr., the kids, their parents, and our friends, and certainly all the players, every single one of them. Thanks again, sincerely, and have a happy set of holidays and a terrific new year!